The windows were covered with plywood painted a sickly green, except for one window, on the upper floor, which stared back uncovered, exposing the interior. Had a transient broken in through there? Might someone be inside who could burn the building down? Across the street, the row of white houses had clearly sat occupied for decades. They look dilapidated, barely standing. And they’re numbered, one through six spray-painted on their fronts, as if someone already marked the order for their destruction. If you haven’t been here before, if you don’t know the area, that’s the first impression. These are no surroundings for a landmark. Last Thursday, I accompanied some business associates from North Carolina and a coworker to the Mutual Musicians Foundation. Anita graciously agreed to stay around and greet us for a tour. I wanted these associates to experience real Kansas City jazz history. It was around 7 p.m. on a sunny summer night. The neighborhood was quiet. The Foundation impressed, just as it always impresses. But when we left, the coworker, judging the surroundings, said he wouldn’t have come here if I hadn’t brought him. I’ve been going to the Mutual Musicians Foundation for over twenty-five years. I know the area. Never – never – have I suffered a negative experience. But this night, as we left, I looked around. And I saw the Rochester Hotel, dirty and boarded except for one window open to the air. I saw six once-vibrant but now decrepit houses. I saw the neighborhood through the eyes of guests who didn’t know it. Through those eyes, it did not look like someplace where an outsider wanted to be. According to an article in last Friday’s Kansas City Star (here), The Kansas City Council unanimously approved the money to secure a construction loan to begin redevelopment of the Rochester Hotel and the six houses. They will be converted into a total of 22 affordable housing units, mostly apartments. The cost is $4.9 million, to be paid with federal funds and federal and state historic tax credits. Construction should start in September and be done in a year. I previously wrote about this restoration and questioned whether there weren’t more more historic redevelopment needs in the 18th and Vine district (in History and Homes and 18th and Vine, linked in the column at the right under Most Popular Posts). I realize now there are not greater needs. New housing graces the south end of Highland at 19th Street. At the north end of the street, restoration of the Boone Theater/Armory Building on the corner of 18th and Highland is being discussed, thanks to a National Endowment for the Arts grant. If the Armory restoration happens, and the Rochester Hotel and houses surrounding the Foundation are renovated, Highland Avenue will again shine as appropriate surroundings for a landmark. Until then, trust me. As my business colleagues discovered, this is someplace where you want to be. I was at the Mutual Musicians Foundation again on Friday morning, for a press conference. Actually, my colleagues and I glimpsed a preview when we were there on Thursday night. In a couple weeks, the Foundation will begin selling Kansas City Wine. Nobody owned the name, “Kansas City Wine.” Now, the Mutual Musicians Foundation does. The wine will be produced at Amigoni Urban Winery in Kansas City’s West Bottoms. The label will showcase a photo from the Foundation’s unique collection of over 300 Kansas City jazz photographs, with a new edition – and a new photo – planned each year. 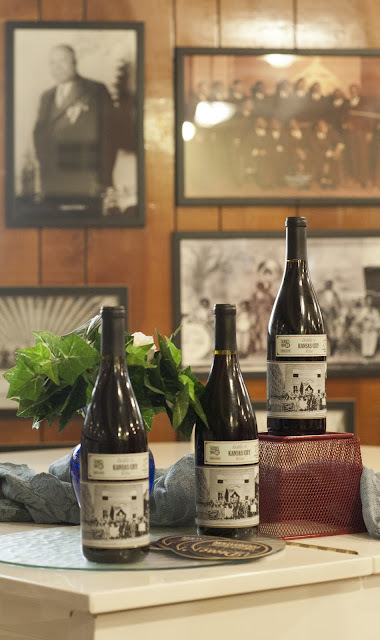 The label wrapping the first bottle is the historic lineup of Kansas City musicians from the May, 1930 opening of the building which was then Musicians Local 627 and today is the Mutual Musicians Foundation. A bottle of wine will cost $35 and will initially be sold exclusively at the Foundation. All profits support the Foundation. Start your collection now. They run out of photos in about 300 years. I have really been paying close attention to your wants, needs, and utterances. They actually seem rather basic and not at all unreasonable. It wasn’t easy but I do believe we have done it. Just open the attachment and your wishes will be granted [the attachment was an ad for the performance]. You are now informed which should make it much easier for a wing weary Magic Jazz Fairy to fly around as KC Jazz fans sleep and whisper in their ears, “A Touch of Color” playing a matinee at The Brick; 1727 McGee, September 3, 2011; 5:00 PM to 8:00 PM. Oh Magic Jazz Fairy, we know we can trust you to get the word out. GREAT to hear about needed renovations of the expanding Jazz District. AND the need for KC jazz supporters to recognize young, serious, Jazz Musicians who are also helping keep jazz ALIVE in KC. Check them out at THE BRICK, you will not be disappointed!! Love the idea of Kansas City Wine. For $35, how does it taste? There was no opportunity at the press conference to sample the wine. I'll need to get back with you on the taste.